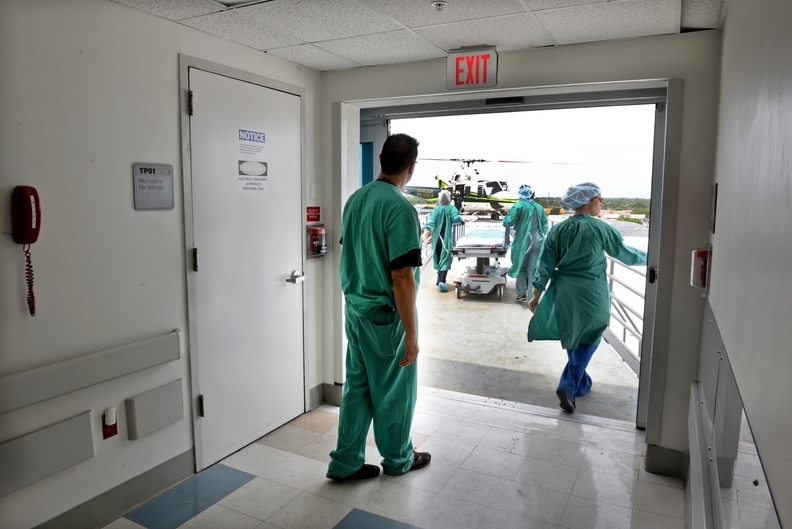 Hospital industry executives are urging the CMS to abandon a proposal that would eliminate the need for a written transfer agreement when an ambulatory surgery center is trying to transfer a patient to a hospital . Currently, surgery centers must have a written transfer agreement with a hospital in order to transfer a patient or ensure all physicians performing surgery have admitting privileges in a nearby hospital. The CMS proposed removing that requirement, citing complaints from ASC industry executives that the practice stifles access to care. Hospital advocates say that they fear that stripping the requirement would endanger patients. In emergency situations, when a patient needs to be transferred from an ASC to a hospital, the receiving hospital quickly needs to know the details of the patient that is en route, such as the type of surgery performed, anesthesia used and problems encountered, according to Marilyn Litka-Klein, a vice president at the Michigan Health & Hospital Association, writing in a comment letter. "The transfer agreement is, in essence, the emergency planning document," Litka-Klein said in the letter. Under these agreement, hospitals and surgery centers outline typical procedures performed and common care protocols, Litka-Klein wrote. Patients who show up in the emergency department from ASCs without a transfer agreement may not come with full medical records, and a hospital may not have the ability to access them quickly, according to Barbara Blackmond, a partner at Horty Springer & Mattern, a law firm that represents hospitals. "Thus, there may be problems with continuity of care," Blackmond said in a comment. "Perhaps the revised regulation would reduce the perceived burden on ASCs, but it will increase the burden on full-service hospitals and will not improve quality of patient care." Surgery centers continued to press the CMS to eliminate the need for a transfer agreement. They argued that even when hospitals grant the agreements, they use them to control centers in improper ways. "Our ASC was contacted by a representative of the local hospital, who stated that our transfer agreement may be at risk if we moved into providing a new procedure at our ASC," Ty Tippets, administrator for the St. George (Utah) Surgical Center, said in a comment. "For too long, the local hospital system has used such tactics solely to stifle or limit competition, which essentially keeps healthcare pricing artificially high and reduces choices for the healthcare consumer," Tippets said. There were 5,532 Medicare-certified ambulatory surgery centers in 2016, up 3.5% from 5,344 in 2011, according to federal data, and roughly 3.4 million Medicare enrollees get care at the centers annually. However, spending has grown about 27%, from $3.4 billion to $4.3 billion, over that five-year period as the facilities provide more services and see more patients.